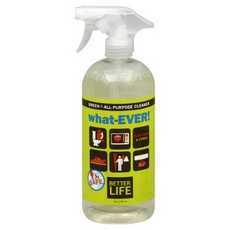 Enjoy Lifestride Better Life What Ever All Purpose Cleaner Clary Sage & Citrus . Safe No Residue No Rinsing Not Tested On Animals Green Like You'Ve Never Seen. Better Life Proves That Safety And Performance Can Play Nice Together. (Note: Description is informational only. Please refer to ingredients label on product prior to use and address any health questions to your Health Professional prior to use.